TheCA1250 is a major step forward in installation amplifiers technology. 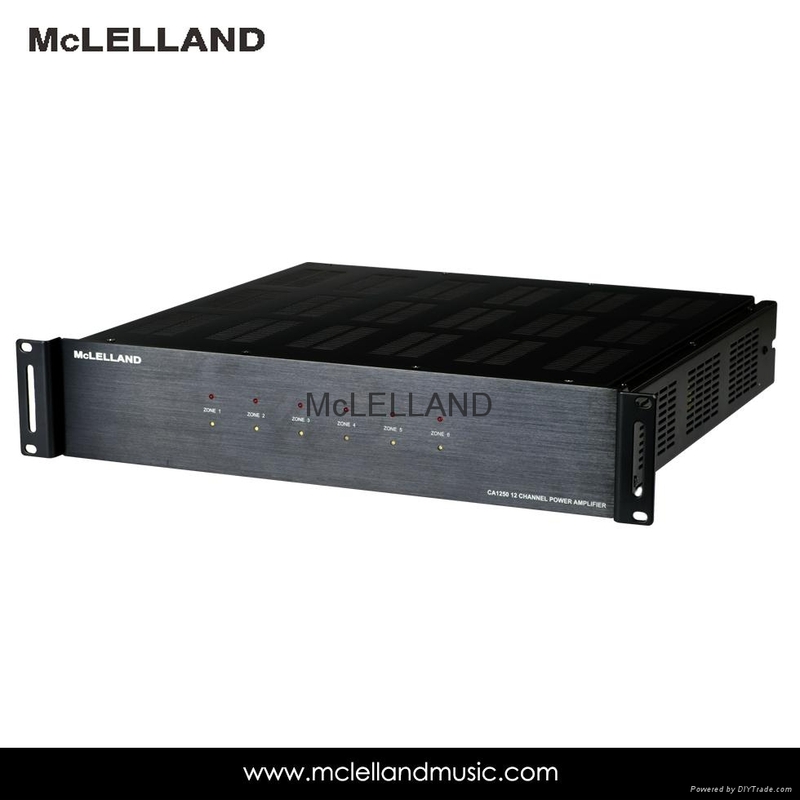 Twelve mono Zone power amplifiers, featuring 85% class D design technology, can operate as 6 independent Zone amplifiers. Self-explanatory Input and Output connections are easy to follow since any of the 12 mono amplifiers can be connected to either 70-Volt, 8-Ohm or 4-ohm speaker circuits. Each of the 12 mono amplifiers has their own input and output connectors and level Controls. Up to 6 stereo Zones (4-ohm or 70-Volt at 50Watts/channel), 6 mono/bridged Zone amplifiers (110 Watt bridged 8-ohm or 140-Volt). Each zone can be configured independently allowing a combination of Stereo 4-ohm or 70Volt and Mono/Bridged 8-ohm or 140 Volt Zones. Dual-function LEDs on the front panel provide both activity and Clip indication for each pair of amplifiers, which also have their own button-selectable Limiter; Stereo/Bridge modes and 4-ohm/70V modes are also selectable. The Ch. Input Line/Bus switch selects between either the Bus Input (button depressed) or the individual Zone’s Input signal. Additional features include: any amplifier with no signal at its input is automatically shut off and the CA1250 is able to operate either on 110V-120V/60Hz or 220V-240V /50Hz AC mains.